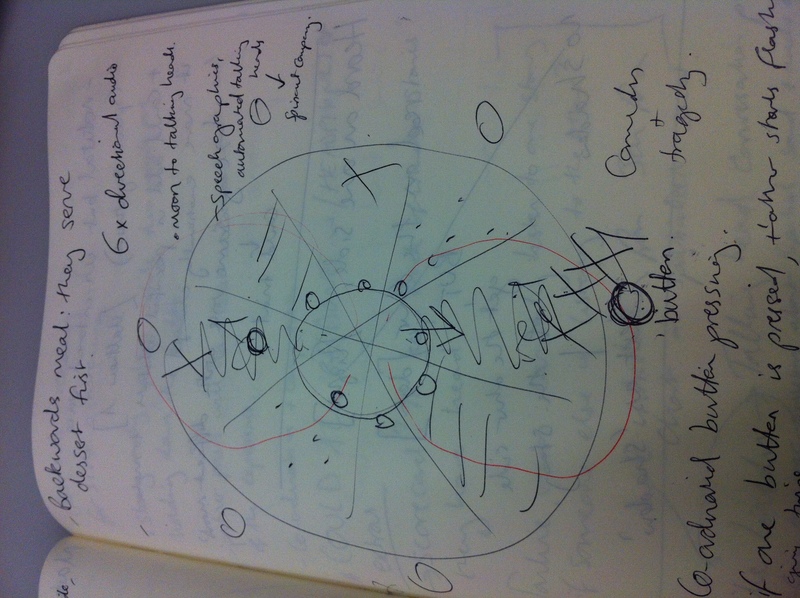 Informatics: a day in the life of my notebook. This post follows the form of a day in the life of my notebook while I’m in The Forum. This morning kicked off with Bob and I finally getting to talk about his manuscript (which I had finished reading over the holidays). He also talked me through a current project on numerical descriptions of objects’ properties as a way of demonstrating how research works. 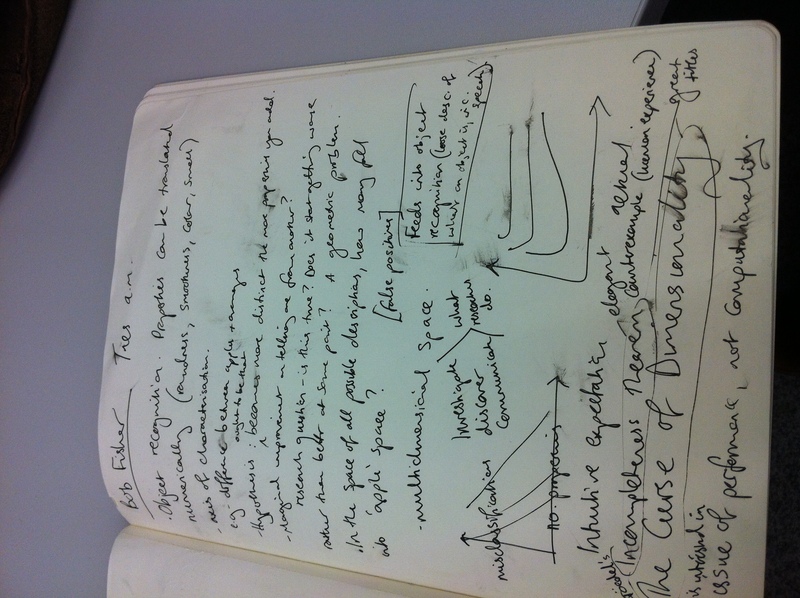 The picture shows some of the notes I made, including a not-to-scale sketch of how the axis of characterisation disproves the hypothesis that on object ought to become more distinct from other objects the more properties you add in. One thing I’m getting from my chats with different researchers is a whole host of fabulous titles to use as inspiration one day. As you can see, a particular gem from this conversation was ‘The Cure of Dimensionality’. I also liked the phrase: In the space of all possible descriptions, how many fall into ‘apple’ space?. Micha and I had planned to meet to chat through the MSc proposal, but while we were getting coffee from the machine we ran into Jon, who said the current draft was fine. 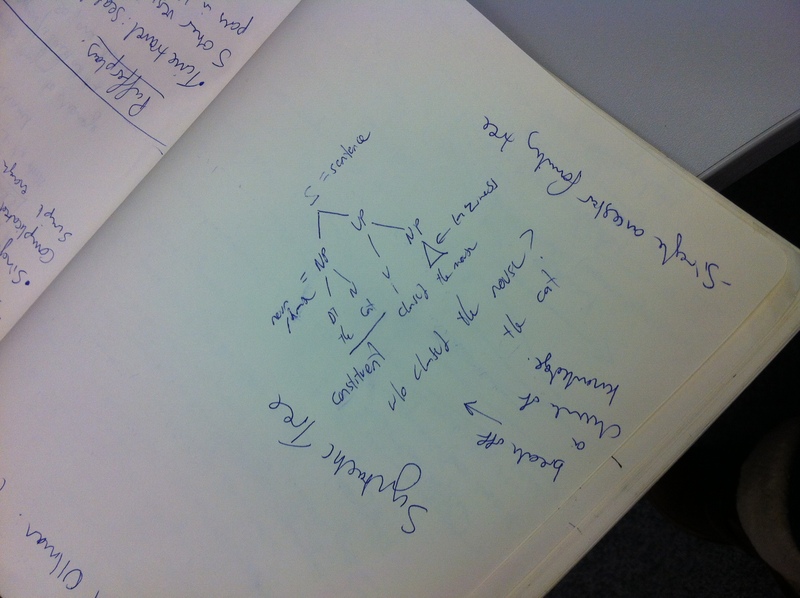 So instead he explained what a syntactic tree was (see diagram in picture), and told me about a researcher called John Conway who invented Surreal Numbers. I liked the latter for two reasons: firstly, my flatmate is called John Conway. Secondly, The Surreal Numbers would be an amazing name for a band. Micha also helped me brainstorm some ideas for the Puffersphere ‘Tables’ pieces (henceforth to be referred to as the PufferPlay). I was particularly taken with the idea of timetravel being used as a way of looping the piece, or having memory loops triggered by time-dependent motion sensors in the floor. 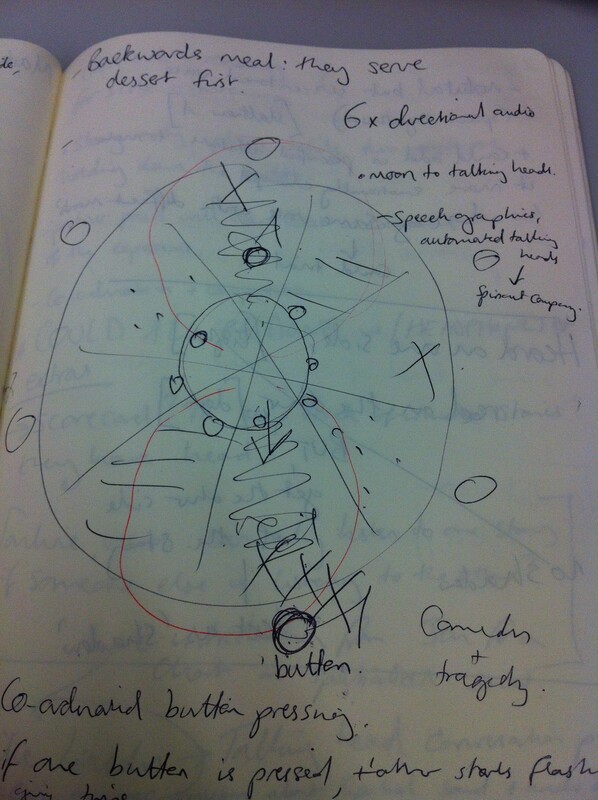 The rest of the afternoon Jon and I talked through logistics for the other ‘PufferPlay’ idea based on the two halves of the brain/ dark side of the moon/ facial recognition/ binary divisions I mentioned briefly in my post on Day Eleven. I’ve been working on these divided monologues since then, but we battered out the physical possibilities of displaying them, and came up with a concept that involves partnership work and is half game-show, half fruit-machine. It involves big, shiny buttons and trust. I may try and build a model out of matchsticks some point, rather like a mocked-up theatre set.